Vito "Babe" Parilli (May 7, 1930 – July 15, 2017) was an American football player. He played quarterback for five seasons in the National Football League and three in the Canadian Football League in the 1950s, and then in the American Football League for all ten seasons in the 1960s. Parilli was born and raised in Rochester, Pennsylvania, an industrial town northwest of Pittsburgh, Parilli graduated from Rochester High School in 1948. 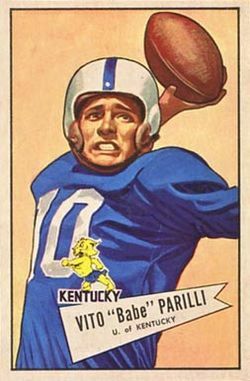 Parilli then played college football at the University of Kentucky in Lexington, and was a quarterback for the Wildcats under head coach Paul "Bear" Bryant. He was a consensus All-American in 1950 and 1951 and was fourth in the Heisman Trophy voting in 1950 and third in 1951. He led the Wildcats to victories in consecutive New Year's Day bowl games in the 1951 Sugar Bowl and 1952 Cotton Bowl. Besides his considerable skills as a quarterback, he was one of the best holders in the history of football and was nicknamed "gold-finger" as a result of kicker Jim Turner's then-record 145 points kicked in 1968 (plus another 19 points in the play-offs and in Super Bowl III). He is one of only twenty players who were in the American Football League for its entire ten-year existence, and is a member of the University of Kentucky Athletic Hall of Fame. In 1982, Parilli was named to the College Football Hall of Fame. Parilli retired as a player at the age of 40 in August 1970. In 1974, Parilli became the head coach of the New York Stars of the World Football League. The next year, he coached another WFL team, the Chicago Winds. He later coached the New England Steamrollers, Denver Dynamite, Charlotte Rage, Las Vegas Sting, Anaheim Piranhas and Florida Bobcats of the Arena Football League. Parilli died on July 15, 2017 in Parker, Colorado of multiple myeloma at the age of 87. ^ "Parilli joins Oakland Raiders". Pittsburgh Press. UPI. August 17, 1960. p. 45. ^ "Parilli is swapped to Boston Patriots". Milwaukee Journal. press dispatches. April 6, 1961. p. 14, part 2. ^ "Oakland trades Parilli to Patriots". Reading Eagle. Pennsylvania. Associated Press. April 5, 1961. p. 47. ^ "Babe Parilli retires from pro football". Daytona Beach Morning Journal. Florida. Associated Press. August 30, 1970. p. 1C. ^ "Babe Parilli". arenafan.com. Retrieved December 19, 2014. ^ "Babe Parilli Dies at 87; Standout Quarterback With 'Houdini Hands'". July 15, 2017. Retrieved April 7, 2018 – via NYTimes.com. ^ "Parilli, Meredith among hall of fame inductees". Gadsden Times. Alabama. Associated Press. February 7, 1982. p. 39. ^ "Nashvillesportsmix.com". nashvillesportsmix.com. Retrieved April 7, 2018.